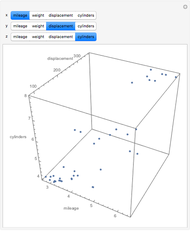 This Demonstration visualizes some four-dimensional data using three-dimensional scatterplots. 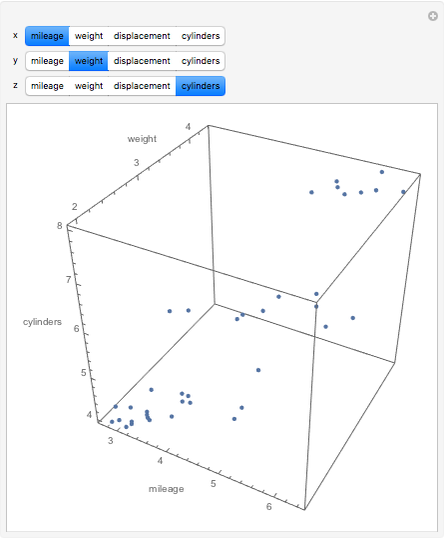 The data is a random sample of 38 automobiles with four variables: mileage (gallons per mile), weight, displacement, and number of cylinders. There are four possible distinct combinations of interest (mileage-weight-displacement, mileage-weight-cylinders, etc.). 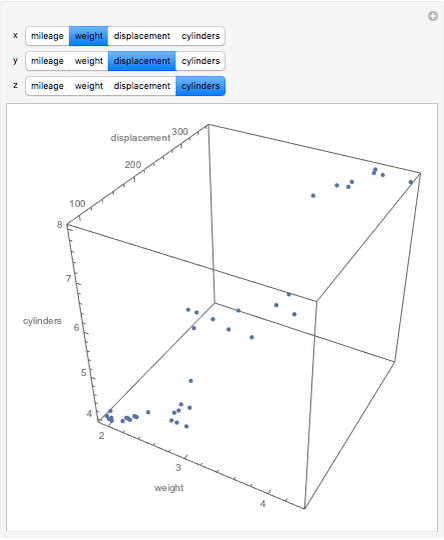 Drag to rotate the plot. 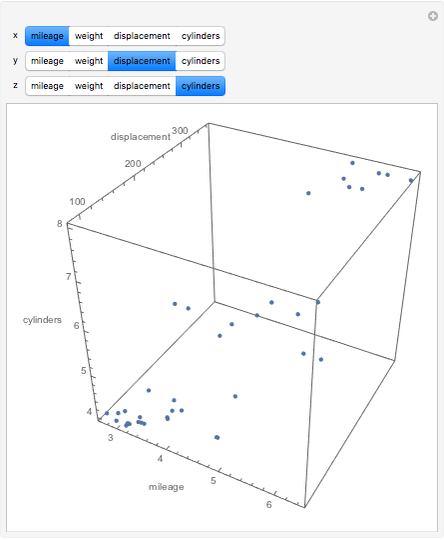 How does mileage depend on the other variables? Do you think the relationship is approximately linear? The data is given in . The method given here is reasonable for dimensions, but as increases, the number of combinations of variables rapidly increases and so other methods are needed. 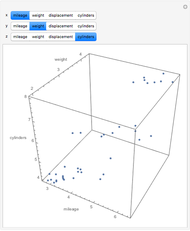 In  methods are discussed for projecting high-dimensional data into three dimensions and then using a 3D scatterplot along with dynamic graphics methods for brushing and linking. B. Abraham and J. Ledholter, Introduction to Regression Modeling, Belmont, CA: Brooks/Cole, 2006. D. Cook and D. F. Swayne, Interactive and Dynamic Graphics for Data Analysis, New York: Springer, 2007. 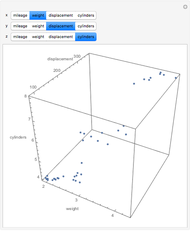 Ian McLeod "Visualizing Higher-Dimensional Data with 3D Scatterplots"